Through the loving presence of her Father, at the age of eight, Maria’s heart was drawn to an ardent love of Jesus. Through dialog with her father, Maria learnt and internalized not only the truths of the faith, but also, and especially, episodes and persons of the Sacred Scriptures. Her father read the Scriptures to her when she was still very young, and she developed a great love for Jesus. Under the guidance of one of St. Gaspar’s companions, (now Venerable) Fr. 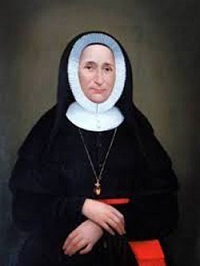 Giovanni Merlini, she founded the Congregation of the Sisters Adorers of the Blood of Christ in Acuto (Frosinone) on 4 March 1834, at the age of twenty-nine. She had been called by the Administrator of Anagni, Bishop Giuseppe Maria Lais, to teach the young girls—she had learned to read and write on her own. Maria De Mattias died at Rome on 20 August 1866 and was canonized on May 3, 2003. Today, Adorers of the Blood of Christ, is an international congregation and is present in many countries like Italy, Switzerland, Croatia, Brazil, Korea, Germany Peru, etc and are committed in sharing Christ's redeeming love to the wounded humanity. The Adorers live among people in a simple and hospitable lifestyle; travelling new roads of reconciliation and solidarity. They carry in their hearts the flavor of "new wine", the newness of hope, the wine of celebration, of fraternity, of justice and dignity that all may experience the fullness of life, of which Christ's Blood is a sign and pledge. No one can pretend to love God who does not love other human beings. It is not we who loved God first, but it is God who loved us first (1Jn 1/19) St. Maria De Mattias exhorts all her sisters to love our “dear neighbors”. We are all sent by God with the power of His Spirit to become messengers of love into the world, just as Jesus was sent by God (LK 4/18-19). The Motto of the Holy year of Mercy: “Merciful like the heavenly Father”: Keeping abreast with the call of holy father Pope Francis, our hearts too are moved to be the compassionate face of the heavenly Father to all, especially to the needy. Responding to the interior call from deep within, we, the members of Aradhana family decided to do something unique. Assist needy elderly people in all levels like food, clothing, cleanliness, washing/bathing, moral assistance etc. A box is kept at the entrance of our institution and encourage people associated with the Aradhana family to contribute towards this cause. Two students from financially deprived background have been identified to support their future for five consecutive years. Wednesday is the day fixed for students of our institution to contribute something towards this cause. The class monitor will collect and hand over the same to the concerned person.